November 26, 2018, 3:00 p.m.
Now that the Thanksgiving turkey has been roasted and the leftovers are mostly gone, Americans are thinking about their upcoming holiday meals, many of which will involve ham, beef, chicken, turkey (again) and other meats. About one in five (19%) Americans says they care more about the price than the quality when it comes to purchasing meat, according to new data from YouGov Omnibus. Millennials between the ages of 18 and 34 were especially likely to say this, with nearly a quarter (24%) saying this is the case. A plurality of people (46%) say that they care about price and quality equally, while three in ten (29%) say they care more about quality. A considerable majority (77%) of Americans also say that they care about animal rights. Women (84%) are more likely than men (69%) to say they “care a lot” or “care somewhat.” Men were twice as likely as women to say “I don’t care very much” (16% vs 8%) and more than five times as likely to say “I don’t care at all” (11% vs 2%). Attitudes about animal welfare may influence purchasing decisions. More than six in ten (63%) Americans say that if they found out a company had a bad reputation for animal welfare, it would make them less likely to buy meat processed by that company. Women (69%) are more likely than men (57%) to say this is the case. 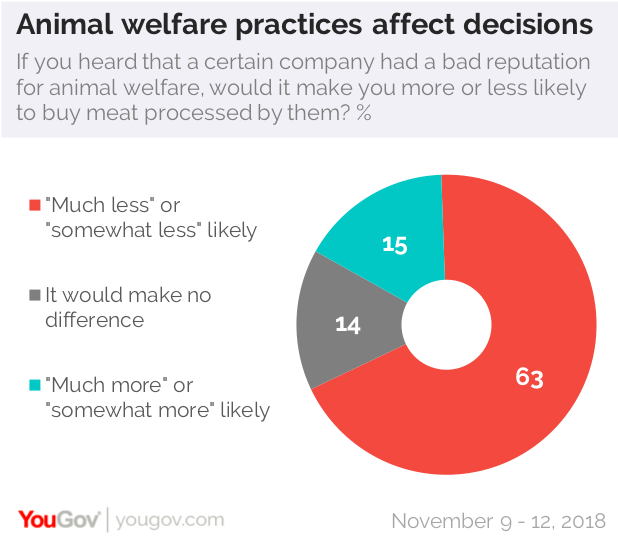 Another 14% of people say the company’s bad reputation around animal welfare would make no difference in their purchasing decision, while a similar number (15%) actually say it would make them more likely to buy from the company. Millennials (22%) were more likely than 35-54-year-olds (13%) and 55-and-older Americans (10%) to say a company’s poor reputation for animal welfare would make them more likely to buy meat from the company. However, many people might not actually be paying attention to who processes their meat in the first place. Nearly a quarter (23%) admitted they “never” check to see what company processed the meat that they buy. Another 21% say they “rarely” check, 24% “sometimes” check, 17% “often” check” and 11% “always” check. The region most likely to say they “never” check is the Northeast, where 31% of people chose this option. In contrast, only 23% of Midwesterners, 21% of Southerners, and 19% of Westerners chose the same answer. Some people might not be checking labels or buying meat at all. About two in ten (21%) Americans say that they’ve tried a product “intended to closely mimic ground beef burgers,” such as products made by Beyond Meat or Impossible Foods. About one in ten (12%) reports having purchased an imitation product from the store and cooking it at home, another 8% say they’ve tried something like this in a restaurant, and 4% say they’ve tried it someplace else. Americans who are 18-34-years-old are more likely (32%) to have tried these products.